Inspired by Savannah: Enter VentureMoms "Spread the Love Giveaway" for a Chance to #Win 33 PRIZES!!! 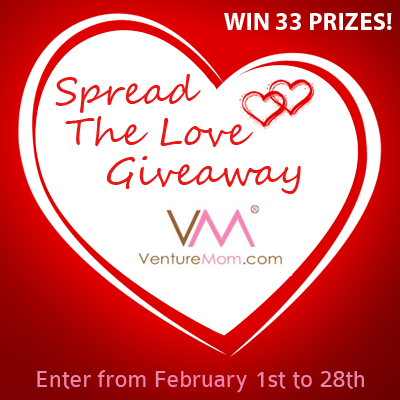 Enter VentureMoms "Spread the Love Giveaway" for a Chance to #Win 33 PRIZES!!! The VentureMoms Spread The Love Giveaway is here! 33 venturemom businesses have come together to give you a chance to win unique, innovative gifts for baby, kids and even mom & dad! Giveaway begins Monday, February 1st and the last day to enter is on Friday, February 28th. ONE LUCKY WINNER will receive all 33 prizes! However, everyone who enters will get something special as a thank you. Entering is easy and can be done below via Rafflecopter below our prizes - the more points you earn the better chance you have to win! Scroll below the entry form to get more info on our wonderful sponsors! Our JUST WRITE card description is perfect for anyone. For 3 months you will receive a variety pack of all occasion greeting cards sent right to your door. We also include a stationery surprise. This is perfect because you will always have a card on hand...birthday, thank you or just an everyday occasion. Sleeping Baby's Zipadee-Zip is a unique solution to help baby transition from swaddling. The star-shaped Zipadee-Zip works like magic and provides babies with the snug feeling of security (the womb-like environment) while still allowing for the freedom of movement of pajamas. With Zipadee-Zip, babies are free to stand up, crawl, roll, walk and move around safely. This versatile sleep garment has 7+ uses and is works like a charm to help babies fall asleep and stay asleep. The Zipadee-Zip is ideal for transitioning babies from swaddling or for babies who do not like to be swaddled. BabyNav is a premiere baby planning service, offering private and personalized consultation to expecting and new families. We provide unsurpassed service leaving you feeling fully prepared, while reducing stress and allowing every member of the family to embrace the magic and joy of pregnancy. But we don't stop there. We also specialize in the post-partum support you need to feel confident and content while navigating the world with your new infant. Jinja Jewelry is proud to offer a large selection of handmade jewelry from Bali including necklaces, pendants, bracelets, earrings and rings. Jinja Jewelry draws inspiration for its beautiful, high quality coral and silver jewelry from local and global trends in affordable jewelry and accessories. By purchasing Jinja Jewelry our customers are helping to support the talented people of Bali and providing their families with a safe and secure future. These exclusive designer creations cannot be found anywhere else! Winner receives a beautiful handmade necklace with a large red coral pendant set in sterling silver with red coral, brown lava rock, glass beads, and red coral chips. The clasp is brushed brass. Inspired by the simple utility, earth-friendliness, and comfort of cloth diapers, GladRags was founded in 1993 in Portland, Oregon. It began as a home-based business that quickly outgrew the extra bedroom and moved to its own building. Today, GladRags is still a small company but with a big presence, promoting positive attitudes toward menstruation and making the environment a safer, cleaner place. GladRags can be found in health food stores and natural pharmacies nationwide. Simply Charmed Magnetic Wine Charms creates wine charms that literally attach through the wine glass, or any glass, with two rare-earth magnets. These charms do not dangle or clink like other wine glass markers, and eliminate the question, "Which glass is mine?" Carrying over 75 themes of charms at wineswithcharm.com, you can find the perfect set for yourself, or gift for any wine lover. Simply Charmed is owned and operated by a mompreneur in LIbertyville, IL. The Baby Dipper bowl enables easy one-handed feeding of infants by parents and also helps toddlers learn to feed themselves. The Baby Dipper bowl's unique combination of features includes a non-slip base, a triangular shape, transparent side walls, and a slanted interior that leads to a spoon-shaped collection point in the lower corner. Available in Bubble Blue or Tickled Pink, the Baby Dipper bowl comes with a matching spoon and fork. Smart Playrooms is both an educational and organizational service, based on the philosophy that physical surroundings have a profound impact on children's behavior and how they interact, explore, and engage in the learning process. Smart Playrooms will convert your play area into a purposefully designed environment, where the organizational system, presentation, and selection of materials are customized to the developmental stages and interests of your children. Winner receives In-Home Consultation and written proposal. The mom-invented, eco-friendly nursing pillow that offers support, comfort, and discretion for mom and baby. For nearly 20 years we have been providing moms with the best Eco-Nursing pillows that allows a mother to comfortably nurse her baby in private while being the safest choice for the environment and safe for babies. Winner receives Who's Your Mamma or Who's Your Daddy tee shirt (winner chooses). zCush first launched the baby nap mats at the end of 2010 and has seen exceptional growth over the past few years. We will soon be introducing new designs and patterns to our Baby Nap Mat product line. The 5-in-1 Baby Nap Mat is ideal for napping, feeding, diaper changing, playing, and holding and passing a newborn with better comfort and support. Winner receives a green Firry Forest Chenille Baby Nap Mat. The award winning Today I Ate A Rainbow kit gets kids ASKING to eat their fruits and veggies by turning healthy eating into a fun game! The rainbow kit comes with a magnetic chart, 4 sets of tracking magnets, The Rainbow Bunch book plus a money back guarantee! The Parking Pal is designed to be placed on the side of your vehicle, where it will remain safely attached at all times. It was specifically created with bright colors, playful illustrations, and a small palm children love to place their hands on. After a couple learning sessions, your child will discover that the Parking Pal is their safe spot, and they will know where to go the second they are outside the car. It also helps teach them that parking lots are no place to play. Buti-bag aims to fulfill the need of moms everywhere seeking a items that are not only smart and versatile, but stylish as well. We create accessories for use by moms and kids in babyhood and beyond. Our uniquely designed Pods will keep your wet wipes moist for months instead of just days! Each buti pod is a soft and durable yet super-flexible and feather-light plastic pouch featuring a center zipper for easy wipes dispensing. Not only do they retain moisture in wet wipes of all kinds, they can also keep dry items DRY and organized, such as coupons, receipts and more. Similar in feel to a very thick ziploc bag, the are the best option to carry around those wipes for when you need them most. Made from environmentally-friendly EVA plastic, pods are recyclable and free from lead, BPA and phthalates. Bubbles and Buttons is a children's party service that offers all you need for the perfect party! We provide dress up items, games, crafts, custom invitations and thank yous. Everything is handmade specifically for your party and can be customized to whatever theme you want. Our standards themes include Enchanted Forest, Royal Kingdom, Under the Sea, Pamper Me, and Up Up and Away. We can ship all our items anywhere in the United States as a complete party package or can assist you in your home within our coverage area. We believe that parties are a wonderful venue to offer keepsakes that children can continue to play even after they leave the party! ZizzyBee Bags are handy, compact, reusable, washable storage bags convenient for every part of your life. The neat freak in your family will love that they help you store and organize just about anything! From diapers/wipes, make-up and sports gear, to even purse clutter these trendy bags makes organization easy and they're see-through so you can easily find what you're looking for. Reduce single-use bag waste while keeping life's clutter cleaned up. With two eco-friendly bag sizes to choose from, ZizzyBee Bags are a perfect fit for storage and organizational needs. Invented by a mom and OB nurse, Assessables UmbilicalSuits allow umbilical cord exposure to allow natural air flow, a method proven to be a safer more effective way to dry baby's cord. Made of 100% cotton, Assessables keep baby covered and cozy while exposing your newborn's umbilical cord. Assessables is so named for the ability to "assess" the cord in the healing and detachment process. The Quick Split is a portable food cutter with a cover for baby and toddler feeding, allowing you to instantly cut your kids� food into safe, bite size pieces when you are out to eat! Easily cuts all your kids� favorites including pizza, quesadillas, spaghetti, burgers, chicken, hot dogs, pancakes, waffles and more! Snap on the cover (without cleaning off the mess), toss in your diaper bag or purse and throw it in the dishwasher when you get home! Handmade in Wilton, CT, Southern Yankee offers one-of-a-kind clothing and gifts using vintage linens, family heirlooms and other up-cycled fabrics. Woombie Air Baby Swaddle The new Woombie Air is the first breathable swaddle that allows excess body heat to escape and requires no wrapping. Invented by a mom of five, 19-year RN, and Infant Care Specialist, the 14-award winning Woombie is a unique peanut shaped h that imitates the comfort and security of the womb resulting in longer periods of sleep. It helps reduce the risk of SIDS as well as prevents overheating, face-scratching, startling, and colic (voted as a top colic product by the Fussy Baby Site). Over a half a million babies and counting have used the Woombie and parents swear by it! Babybindle aims to make parent's lives better by providing Simple, Innovative and Functional baby products to assist in the ever challenging task of raising a family. Founded by Sandra Frawley, a Huggies MomInspired Award winner and inventor of the SeatPak, Babybindle is a recognizable brand that parents can trust to solve their everyday parenting needs. Wee Urban offers the modern family a unique and fresh collection of baby gear and accessories that goes beyond the conventional and explores the exceptional! Tired of traditional pinks and blues and cute motifs, we offer sophisticated designs, conscious organic alternatives, practical functionality and superior quality. Using our custom certified organic cotton blends, low-impact dyes, and other trendsetting fabrics, we hope to inspire families to be make better choices and of course- do it all in urban style! Winner receives a set of (2) Cosy Basics Sleep Bags! Handmade in Milwaukee, WI - owner Kelley Legler created this company after being let go from her job. Sewing literally saved her sanity and now she employs other moms for a creative outlet. Ribbon tab security blankets with satin and plush minky fleece fabric providing sensory play for babies. Ribbon tabs are sewn shut into Tabs to provide added security. *It's universal, reusable, convenient for travel, dishwasher safe, with virtually no clean up! *Refresh*Reuse*Recycle! At Crave Simple we set out on a journey in search of ways to make life just a little bit simpler. The "go-to" bag from making life simpler. How often do you decide not to switch handbags because you don't have the energy or time to unload and reload your essentials? Meet your solution. Throw in your keys, cash, credit card and lipstick. Bring it with you wherever you go in your handbag, to the gym, in your diaper bag, or a beach bag then take it out to lunch or dinner. Simple, easy and why didn't we think of it sooner? At ChicoBag, our mission is to help humanity bag the single use habit. We mean the wasteful, throw-away habit that overflows our landfills and clogs our oceans. We do this by advocating for waste reduction, and designing the highest quality, longest lasting reusable bags. We offer products that empower people to take an active role in solving the single-use problem. At ChicoBag, we make bagging the single-use habit easy. Bittylab, LLC, headquartered in New York City, New York, was founded in June of 2010 by Priska Diaz, wife and mother of two children. Bittylab is focused on offering innovative new products that raise the bar with quantifiable benefits and ultimately translate to better performing products for mom and baby. BARE air-free baby bottle is Bittylab's first of a complete line of baby products under development. To learn more about Bittylab, please visit www.bittylab.com. The patented LillyBit Uptown Diaper Clutch is the stylish alternative to bulky diaper bags; designed with luxurious details and convenient features that allow modern parents to change baby in a snap! It holds and cleverly conceals essential baby gear inside a unique tri-fold bag. Easily convert the strap to fit your personal style. Wear over-the-shoulder, as a handbag, wristlet or clutch. I love fabric and making things out of it. I feel that fabrics can totally transform a space and are a great way to redecorate and change the mood in a space. When I'm not swooning over fabrics, I'm spending time with my husband and two littles Ethan & Phinea. Baby Undersocks was started by a mom of four boys, who wanted to find the perfect winter layering piece that would keep baby socks on when its cold. Undersocks are an award-winning winter layette piece, designed for keeping baby's feet and legs warm and comfy. Undersocks are soft, bamboo thermal underpants with plushy socks sewed into the bottom. They are made to be worn underneath your baby's favorite outfits as a warming layer. Keeps socks on baby's feet and keeps the entire leg warm too. Made of ultrasoft, breathable bamboo thermal fabric that feels great against baby's sensitive skin. Making Spirits Bright: One Book At A Time empowers children to live their best life through the powerful messages in the books that are published. What's more fun than showing your baby how to blow kisses? Teaching them how to display respect, empathy, and other powerful traits that will support them on their journey through life. Award-winning author Maria Dismondy releases her fifth children's book for a younger audience-ages birth-three. 8 To The Bar is a local company out in Bridgeport, CT. They produce a gluten free snack bar and an 8 ounce snack bite package. Together Jim and Kathy bring you 8 To The Bar, their gluten-free and dairy- free composition of 8 organic nuts, oats and dried fruits blended in perfect harmony with local honey, organic coconut oil and coconut manna. Together they are promoting a healthy choice one gluten free snack bar at a time! Enter here and the more points you earn the bigger chance to win! Scroll below to see who our sponsors are! Definitely worth checking out! Your curated guide to fashion, food, family, and fun in Fairfield County, Connecticut! Macaroni Kid and its family of Publisher Moms are dedicated to delivering the scoop on all the family-friendly events and activities happening in their communities each week. Check out Macaroni Kid's list of communities and sign up to receive your free weekly newsletter. Applaud Women LLC consists of an online quarterly magazine focused on women's issues & interests. It was created to inspire, inform & applaud women. The company also an online cyber mall with over 150 international retail businesses in 25 categories, from Apparel to Travel; High end to Low Cost, for the whole family. As a special gift, anyone who likes our page from now to the end of the year can post information about their business with a weblink. I do lots of things for family, food, green items, decor, health products lots of reviews and giveaways. Living Smart Girl is a place for women to learn about living smart, being fit & healthy, and being in control of who they are! Join me on my journey to Living Smart! I am a stay at home mommy of a 16 year old daughter, and 2 year old son. My blog focuses on Couponing, Recipes, Reviews, and Giveaways. Busy mom of 3 delivering you quality giveaways and honest reviews. I am the mother of two beautiful girls, Savannah Rose and Arabella Sofia. I created my blog as a place to spotlight moms turned entrepreneurs and review and share their products, so other moms out there on the fence about a product idea or business dream, could find inspiration and a push to take the leap and become a business woman and super mom. Reviews, giveaways and a little bit of everything! We are a mommy blogging blog. We cover a lot of product reviews for kids, moms and dads. As of now we do have a small valentines day even going on and I would love to also do this. Among Many Blessings is about the many blessings of being a mom, a Christian, and running a home. I also chat a bit about life and Kid friendly activities. Stephani at Generous Savings, hopes to help even the busiest people save money. Generous Savings provides countless ways to save, from coupon deals, store matchups, how to coupon posts, amazing Amazon deals, other great online deals & coupon codes, plus frugal DIY projects. A busy mom and wife herself, Steph knows that there are only so many hours in a day. She has streamlined saving money, so that anyone can learn and do it. Her passion is helping others and showing people that they can help their family and non profits with just a few extra minutes a day. Saving money while losing weight. I blog about weight loss, health, frugal, lifestyle, family, kids, pets, autos and travel. PR & Family Friend Blog specializing in Reviews & Giveaways. Content includes recipes, crafts, traveling, parent and family life. Dandy is an advertising site based out of Boston that advertises for various companies to people worldwide. We provide giveaways, deals, and articles to the readers while advertising for various shops and businesses. My blog is about freebies, giveaways, reviews, deals, coupons and so much more! We are a Lifestyle blog. Offering deals, Homeschool posts, reviews, giveaways and a look into our lives. From us at DoesMommyLoveIt.com, you can continue to expect a robust line-up of the newest and grooviest reviews and giveaways, but with more social issues awareness in the mix to help you stay informed, equipped, and knowledgeable on the need for the greater good. We hope you will join us in the evolution of our review site! I share organizational tips, busy bag ideas, business reviews, giveaways, personalized Christmas stockings and more. I also am one of Bowdabra's design members so I do two projects a month using ribbon and their products. I blog about mommy problems and we all share advice. I like to also share WAHM companies with my fans. We also do product reviews and have fun giveaways. Challenging homework, work, whines, mornings, marriage, bills, um PTO?, diapers, and that getting to the gym, one misfit moment to the next. This promotion is in no way sponsored, endorsed or administered by, or associated with, Facebook. We hereby release Facebook of any liability. Winner(s) will be contacted by email 48 hours after the giveaway ends. If you have any additional questions feel free to send us an email: [email protected] VentureMom is not liable for any of the products given away.